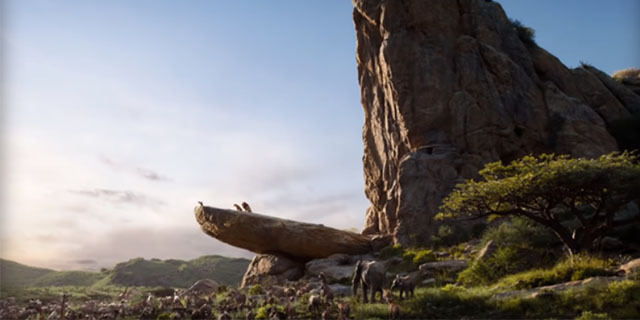 "The Lion King" live-action remake of the classic animated film has roared to life with its first trailer. Disney debuted the 90 second teaser on Thanksgiving Day. The clip opens up with iconic images made famous in the 1994 flick. James Earl Jones, who will reprise his role as Mufasa's voice, is heard narrating, "Everything the light touches is our kingdom." The trailer then cuts to a group of animals including zebra, giraffes and elephants. "But a king's time as ruler rises and falls like the sun," Jones continues. "One day the sun will set on my time here, and will rise with you as the new king." "The Lion King" will hit theaters July 19, 2019, and stars Donald Glover (Simba), Beyoncé (Nala), Seth Rogen (Pumbaa), Keegan-Michael Key (Kamari), Chiwetel Ejiofor (Scar) and Billy Eichner (Timon). The film is directed by Jon Favreau, who also helmed the live-action and CG version of Disney's "The Jungle Book." More than a year ago, Seth Rogen tweeted a picture of the cast and the voices they would be playing. Rogen told Entertainment Tonight in July about working with the star-studded cast. "It's thrilling!" he said. "One is because I'm a big fan of 'The Lion King.' Two is because it's the most expensive movie I'll have anything to do with probably, so that's thrilling." "The Lion King" held the title of top-grossing animated film of all time for several years after bringing in $968.8 million at the global box office. Its music earned it two Academy Awards — for the score and Elton John's "Can You Feel the Love Tonight" — and it was adapted into a Tony-winning Broadway musical.